10 September 2014 | In Brazil, organized land grabbers and squatters cleared swaths of the Amazon for cattle grazing and then took advantage of government programs that grant land titles after the fact. In Indonesia, palm oil companies bribed local officials to obtain licenses to convert forests to plantations. In Cambodia, a rubber company was issued a land concession five times the size allowed by law, with more than half of the land area falling within a national park. In Tanzania, a jatropha company fudged the authorship of an environmental impact assessment and convinced villagers to sign documents they didn’t fully understand. Illegal deforestation takes on many forms around the world, and according to new research released today by Ecosystem Marketplace publisher Forest Trends it is more rampant than previously understood. And its drivers are shifting. While in the 20th century tropical forests often went to meet demand for timber, about three-quarters (71%) of all tropical deforestation between 2000 and 2012 was caused by commercial agriculture. Nearly half (49%) of all tropical deforestation in this period was the result of illegal land conversion for commercial agriculture, and nearly one quarter (24%) was the direct result of illegal land conversion for commercial agricultural products bound for export markets. The commodities exported at the end of the process are worth an estimated $61 billion annually. What is driving all of this outlawed and often unscrupulous activity? A lot of it has to do with consumer demand. As the global population swells to nine billion by mid-century, and as millions of people escape the pains of poverty and join the growing global middle class, they are buying more hamburgers (beef), chicken (raised using soy feed) and toothpaste (palm oil), and as incomes and literacy rise shipping more goods around the world in cardboard containers and consuming more paper (both packaging and book materials are now increasingly sourced from so-called “conversion timber, the product of trees cut down when converting forestland to other uses such as a large-scale oil palm plantation). The Brookings Institute estimates that there are currently 1.8 billion people in the middle class, and that we can expect that number to rise to 4.9 billion by 2030. The challenge, then, will to be meet the growing demand for beef, leather, soy, palm oil, pulp and paper and other products without ravaging the world’s remaining tropical forests. Doing so will be essential to protecting the rights of the indigenous peoples and communities who live in and depend on forests, and curbing runaway climate change. Illicit land conversion for mega-crops releases nearly 1.5 gigatonnes of carbon dioxide (CO2) into the atmosphere annually about a quarter of the fossil fuel-based emissions of the European Union. If the international trade in agricultural commodities from illegal deforestation were a country, it would be the sixth largest contributor to climate change in the world. “There is a lot of policy work and research and meetings and discussions that have been happening over the past two, three, four years regarding commercial agriculture and these commodities as a driver of deforestation, but the legality point has been almost non-existent within those debates, said Sam Lawson, the lead author of Consumer Goods and Deforestation: An Analysis of the Extent and Nature of Illegality in Forest Conversion for Agriculture and Timber Plantations. “And that’s just madness given how important it is. In the report, Lawson offers three main reasons to pay closer attention to the legal status of global deforestation. The first reason is scale. Overseas consumer demand has resulted in the illegal clearing of more than 200,000 square kilometers of tropical forest since the turn of the century, a rate of about five football fields per minute, the research finds. 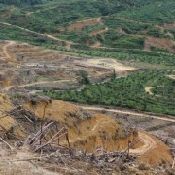 An estimated 40% of all palm oil, 33% of tropical timber, 20% of all soy, and 14% of all beef traded internationally comes from ex-forested land that have been illegally cleared. So, if we ignore these illegal activities, we’re actually missing a chunk of deforestation roughly the size of the land area of Ghana. The second reason has to do with tactics. Namely, the idea that the methods used to fight illegal deforestation are categorically different than those used to curb legal deforestation. Illegal activity can be stopped by revoking land concessions, issuing fines, or sending perpetrators to jail, whereas none of these strategies can be used to stop legal deforestation. Also, many of the strategies to fight illegal deforestation have proven to be very effective. Brazil has reduced its deforestation 70% since 2004, mainly because of crackdowns on illegal clearing of land for soy and cattle ranching. Marina Silva, a current presidential hopeful who served as Brazil’s Environment Minister from 2003 to 2008, led the effort to shut down over 1,500 illegal operations. So, rather than passing new laws and policies, governments might be wise to work instead on enforcing the laws and policies already in place, the report argues. The third reason is that reducing illegal deforestation is necessary to making any other effort to save the world’s tropical forests work. In particular, the many recent private sector commitments to “zero deforestation supply chains including those by pulp giant Asia Pulp and Paper and palm oil trader Wilmar are undermined by illegal activities, since sustainably sourced products will have to compete with products sourced not only unsustainably, but also illegally, leading to huge price gaps. As long as illegal operations are business-as-usual and go unpoliced, there will always be companies willing to take the path of least resistance. Case in point: a recent concession of 470,000 hectares in the Republic of Congo, to a Malaysian company called Atama that has no previous experience in the palm oil sector, was found by local inspectors to be in breach of regulation. REDD, the United Nations (UN)-backed program for developed countries to pay developing ones to reduce emissions from deforestation, is also undercut by illegal activity. The REDD Readiness Preparation Proposals that countries submit to the UN-REDD Programme and the World Bank’s Forest Carbon Partnership Facility in hopes of securing upfrontreadiness’ funding rarely mention governance issues or the extent to which illegal deforestation for commercial agriculture has been the biggest recent driver of deforestation, according to Lawson, and even fewer propose methods for addressing illegal versus planned and legal deforestation. The official statement on drivers of deforestation agreed to by parties to the UN’s Framework Convention on Climate Change in 2013 does not specifically address illegal conversion for commercial agriculture. “In terms of where most of the money and the effort is going on REDD, there is far too much in my view on tinkering with MRVs (monitoring, reporting and verification) and measuring carbon and negotiating changes in policies regarding development of forested land in these countries and not nearly enough on improving governance and dealing with illegality issues, he said. One of Indonesia’s core REDD strategies, for example, is persuading companies that have already received land concessions to clear forests for palm plantations to “swap those concessions to already degraded land, such as nine million hectares on Kalimantan that was found to be suitable to grow palm. But voluntary commitments such as these are unlikely to work if many palm producers blatantly operate in violation of national laws, the report argues, and it will be difficult for donor governments to justify payments for performance for reduced emissions in the context of activities that should have already been shut down. Though the report offers much fodder for concern, perhaps its most important finding is that, “these illegalities are not insurmountable. In fact, the issues that the agricultural commodity sector is currently facing are ones that have been addressed by the timber industry throughout previous decades. The ongoing Forest Law, Enforcement, Governance and Trade (FLEGT) action plan, for example, has the European Union develop bilateral agreements with producer countries such as Indonesia. Through these processes, stakeholders from government, civil society, and private sector institutions in the producer country get together to define what legal timber means and establish verification systems to ensure that exports meet this definition. These agreements are government-to-government and legally binding, and they guarantee a market for the products in exchange for improved forest governance. “One of the ways of getting ahead of the curve on agricultural commodities is if you learn the lessons of what took the timber community 20 or 30 years to realize that you need regulation at the consumer country level rather than just voluntary policies, and you may need to look at legality instead of sustainability, Lawson said. There are, of course, differences between illegal deforestation driven by timber versus agriculture. For one, when land is unlawfully cleared for timber, those logs are sent to market immediately and only once, whereas if a forest is cleared for cattle or soy or palm, the fruits of that illicit clearing will be produced continuously and sent to market over years or decades. In many cases, developers really only want the wood from a land concession but obtain concessions for agriculture rather than timber simply because those permits are easier to come by. Lawson notes that the commitments coming from the private sector promise “zero deforestation in the future, so much of the trade being done by these companies will still be from land that was illegally deforested in the recent past. However, there are some ways in which addressing illegal deforestation from commercial agriculture might actually be easier than dealing with illicit timber markets. While trying to determine whether a forest was felled above the legal yield can be tricky, conversion of forest to agriculture can be detected fairly easily from satellite imagery, and tools such as Global Forest Watch allow anyone with an internet connection to access remote-sensed images of forest losses and gains. Also, while agricultural commodity supply chains can be complex, many of them are actually simpler than the supply chains for timber and wood products, according to Lawson. The report therefore argues that a process similar to FLEGT, that involves many stakeholders discussing legality and deciding on where to draw the line, could work in addressing illegal conversion for agriculture. Doing so could help countries on the verge of massive illegal deforestation countries such as the Republic of Congo and Papua New Guinea to create a process that would bring commercial agriculture to the light side, avoiding at least some of the imminent forest conversion that would be disastrous for forest peoples and the global climate. Allie Goldstein is an Associate in Ecosystem Marketplace’s Carbon Program. She can be reached at agoldstein@ecosystemmarketplace.com. Healthy forests are the planets first defense against climate change, but our voracious appetite for palm oil and soybeans is driving their destruction at higher rates than we’ve seen in years, according to a new Forest Trends report. What’s more, half that destruction is illegal meaning new laws won’t make a difference without enforcement.